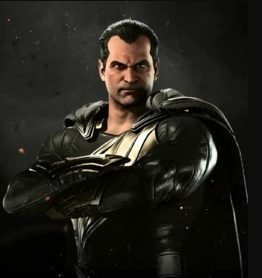 This page contains a character guide for Black Adam in Injustice 2. Here you’ll find movelists, combos, juggles strategy guides and recommended gear for the villain character. For more Injustice 2 content, head over to our Injustice 2 top page. Click here to go to our Injustice 2 Villains Directory! Teth-Adam’s power comes from yelling the word “SHAZAM!” This imbues him with the powers of six gods and heroes of the ancient world. He rules his nation of Kahndaq with an iron fist. He is classified as a Power User. Black Adam is one of the most powerful characters seen in Injustice: Gods Among Us. Like Shazam, Adam’s powers are derived from ancient gods, though where as Shazam is empowered by Greek/Roman deities, Black Adam’s powers are given from the Egyptian gods. Black Adam possesses super human strength, speed, stamina, and invulnerability on par with Superman himself, as well as the power of flight, and significant skill in magical manipulation, as Adam is able to use his magic lightning in several different ways than Billy can, shaping it into streams of lightning he can conjure from his hands, orbs to protect himself or throw, he can even shape it into a cage around himself that he can transform into a larger bolt. Meter Burn R2 (must press R2 at the beginning of Lightning Storm). Black Adam summons three orbs of lightning that revolve around his body. Below are combo and juggle inputs for Black Adam , including corner strategies and restarts. He wears a black bodysuit with a golden lightning bolt on his chest. Gold gauntlets cover his forearms with black gloves over his hands and golden greaves over his legs with black boots, along with a gold belt with a gold sash tucked in. He is now bald, and his costume has golden accents on the collar and waist. He wears a cape with his gold lightning bolt running down it. He has new gauntlets and golden armbands on his biceps, serpent designed greaves, and a dagger sheathed on his chest. Unlike Shazam, Black Adam is empowered by gods from Egyptian Myth: Stamina of Shu, Speed of Heru, Strength of Amon, Wisdom of Zehuti, Power of Aton and Courage of Mehen. Black Adam’s intro is an allusion to his origin, in which Adam arrives back on Earth after being banished into space for five-thousand years. Interestingly, when Black Adam is returned to his ancient mortal form in Chapter Nineteen of the Injustice Comic, he bears a very strong resemblance to the Wizard Shazam before the New 52 reboot. 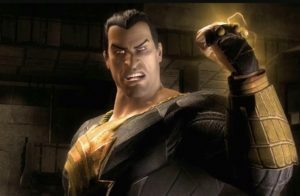 The Super Move used by Black Adam is strikingly similar to one of Captain Marvel/Shazam’s Heroic Brutalities in Mortal Kombat vs. DC Universe. Black Adam’s outro quote is directly taken from his own miniseries “The Dark Age”.